Pizza is definitely one of those foods with a universal appeal. 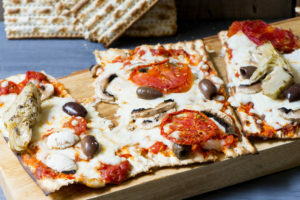 One of the exciting things about it is the numerous ways to enjoy one, whether it’s having one at a restaurant, making your own, or getting creative with the choice of toppings. In this case, we’re going to show you an easy way to make your own tortilla pizza. The process should take you no more than five minutes and we think you’re going to be pleased with the end result. Let’s begin with the items you’ll need. Begin by preheating your oven to 425 degrees. Use a baking sheet and grease it down with the cooking spray. Lay the tortilla on the sheet and then grab a spoonful of the marinara sauce, spreading it evenly across the tortilla. Top the tortilla/pizza with the mozzarella cheese, the red onion, and the pepperoni. Bake the tortilla for about five minutes or until it becomes crispy and the cheese has fully melted. Remove it from the oven and add the basil leaves as garnish. Cut the pizza into slices and you’re ready to serve. Do you happen to own one of those slow cookers better known as a Crock Pot? If so, today’s recipe for Chicken Tortilla Soup will be right up your alley. Here is what you’ll need to prepare it. 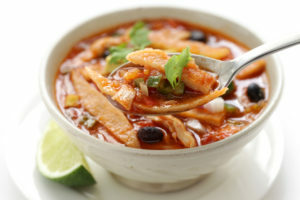 Place the onion on the bottom of the Crock Pot before following with the tortillas, chicken, cornmeal, tomatoes, the spices, broth, beans, and the enchilada sauce. Allow the mixture to cook on high for at least four or five hours or on the low setting for eight hours. Shred the chicken and return it to the pot. You can optionally add canned corn just to heat. Give the mixture a taste to see if it needs seasoning and add pepper and salt as you feel necessary. Fresh lime, chopped jalapeños, and shredded cheddar are a few garnish options. 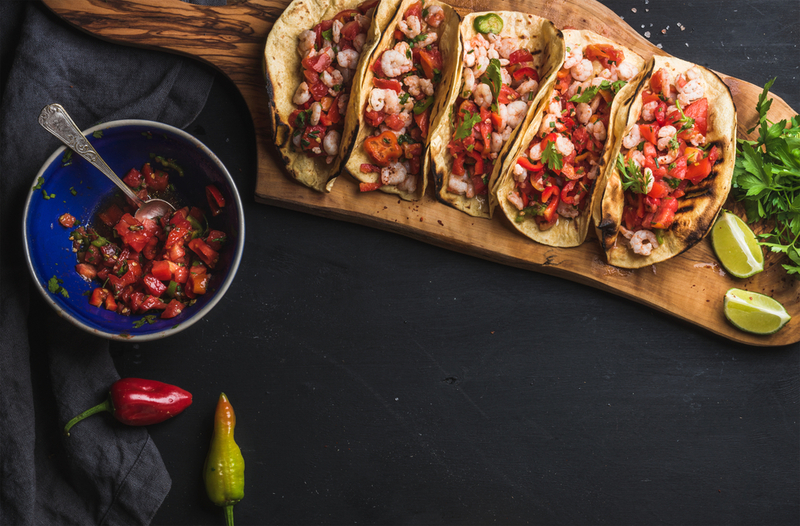 Shrimp tacos may not be what most people go to when they start to consider Thanksgiving recipes, but who says you have to stick to conventions? This tasty shrimp taco comes with a little bit of extra southern Arizona spice to give it a unique twist. Let’s begin. Begin by heating a non-stick pan over medium-high heat. Season the shrimp with the creole sauce and then put it aside for now. Warm up the tortillas in the pan and place them on a warm plate. Add the bacon fat to the pan and once it’s melted, add the shrimp you seasoned earlier and cook everything together. While the shrimp is cooking, place some of the cabbage on the tortillas. Once the shrimp is cooked you’re ready to proceed to the next step. Place the shrimp on top of the cabbage, add the hot sauce, the red onion, the cholla, and then the cilantro leaves. Serve the tacos with your rice or beans of choice and you’re ready to enjoy! 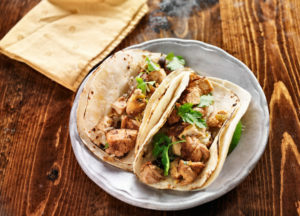 Since it’s Taco Tuesday, we’re showing you how to make some good old-fashioned chicken tacos, because just about everyone likes tacos. Let’s get started with the ingredients. For the chicken filling, saute the peppers, onion, jalapeño, and garlic in a large skillet for about five minutes until they’re softened. Add the diced tomatoes and then stir everything together. Follow by adding the cumin powder, chicken, and chili and then mix everything together well. Allow the mixture to simmer for about ten minutes and then add some salt. Place the filling aside for now. For the tacos, heat the vegetable oil in a large skillet. Also, make sure you have a paper towel-lined plate ready to allow the tortillas to drain. Test the oil by placing a small tortilla in it. If it starts to bubble, you’re ready to fry. Place one tortilla at a time in the oil, making sure to fry both sides for about ten seconds. Place the tortillas on the paper towel-lined plate and fold it in half, repeating the process for the rest of the tortillas. Fill each tortilla with a pair of heaping tablespoons of the chicken mixture. Sprinkle the tortillas/tacos with two teaspoons of cheese before sealing them with a toothpick. Cook the tacos in the skillet you used earlier, adding more oil if necessary. Cook them on medium-high heat until they become crispy on both sides. Once they’re ready, move the tacos over to a platter and add the lettuce, tomatoes, or the pico de gallo depending on what you chose. You can also add more cheese if you like. One of the easiest meals you can prepare is a quesadilla. We’ve highlighted a couple of different ways to prepare them with some unique twists, but today we’ll tell you all about the basics with a little bit of improvisation. For the most basic of tortillas, all you’ll need is some cheese and a tortilla. You may wish to go with sharp cheddar cheese, but feel free to go crazy and experiment with whatever cheese you like. Because quesadillas require so little at their most basic level, you can easily prepare them in a microwave. If you happen to be a college student looking for something easy and inexpensive to prepare, consider quesadillas. Begin by shredding some of the cheese, assuming yours didn’t come pre-shredded. Distribute it evenly between a pair of tortillas or a regular sized tortilla. The next step is to add whatever additional ingredients you may want, such as beans, bell peppers, or meat for instance. If you plan on adding more ingredients, it’s probably a good idea to reduce the amount of cheese so that the quesadilla isn’t excessively full. 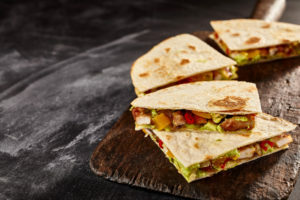 Place another plate on top of the quesadilla to ensure it retains its shape while it’s being prepared in the microwave. Cook it on high for about a minute or so and you’re ready to serve. Strawberry is a fruit with a near universal appeal. Combined with burritos, it’s practically a match made in heaven. That’s why today’s recipe will show you how to prepare some truly delicious strawberry burritos. Let’s get started with the ingredients. 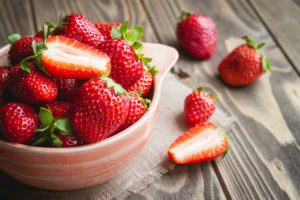 Use a deep bowl to add the sugar and sliced strawberries, making sure to stir them well so that the strawberries are sufficiently coated. Allow the mixture to refrigerate for a minimum of an hour. Use a wet towel to moisten a tortilla. Sift the powdered sugar over each tortilla as well as some whipped cream. Flip the tortilla over and place the strawberries in the middle of it. Fold the edges of the tortilla so that it rolls around the strawberries. Cover it with some more whipped cream and then sift some additional sugar on it. Make as many burritos as you like with the ingredients you have available and you’re ready to serve. Need an easy dessert recipe for the weekend? There are probably few people in the world who don’t enjoy the sweet taste of an apple pie. 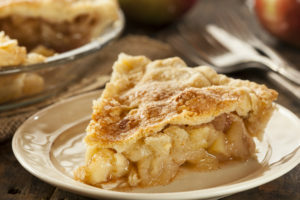 If you’re a fan, we think you’re going to love this recipe involving tortilla cups and apple pie. Let’s get started with the ingredients. Begin by preheating your oven to 400˚ Fahrenheit. Grab a muffin tin with space for six cups and put it aside for now. Use a work surface to brush the three tortillas with melted butter followed by dusting them with the cinnamon sugar. Stack the tortillas and cut them into quarters. Place a pair of pieces in each of the muffin cups and then bake for about eight minutes until they’re crisp and golden. While the cups are baking, go ahead and prepare the filling. Mix the cinnamon sugar, apples, and lemon juice together in a frying pan. Place it over medium heat to melt the butter and saute the mixture for about five minutes until it becomes soft. Take the cups out of the oven and allow them to cool a little before adding the apple mixture. Top them off with the caramel sauce and whipped cream and you’re ready to serve.